My nephew Jacob (far left) was in town this week after just returning home from an 8 month stint in Iraq. He is a marine and is only home for about 1.5 weeks. I promised him when he was deployed that once he returned, I would get a fishing guide and go out for a day of striper fishing. After several days with copious amounts of rain, the weather cooperated and we had beautiful weather. 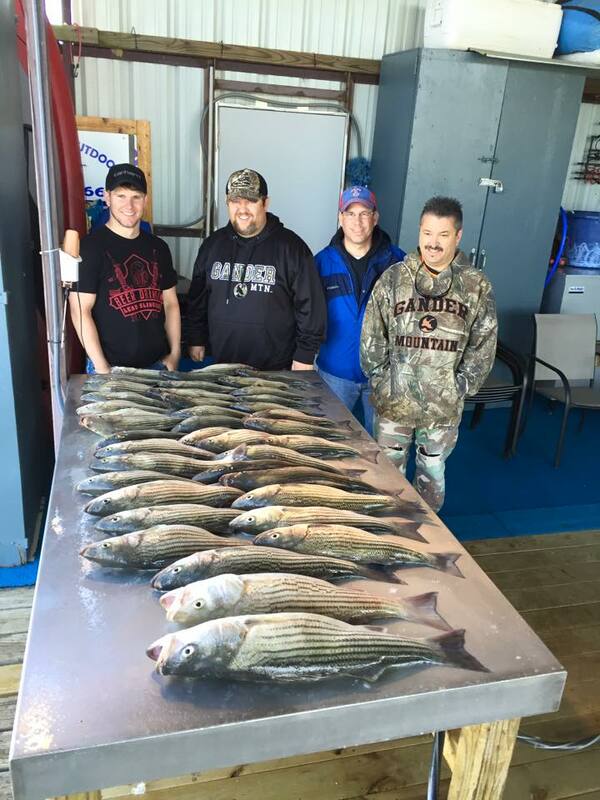 With the lake on the fast rise, I was worried that the fishing might be all out of whack, but our guide (John Blasingame - Adventure Texoma Outdoors) said fishing had been great and to come on up. We headed out at daylight and were catching fish within 20 minutes of leaving the dock. We steady picked at them and 4 of us had our limit by 9:30am. I was thrilled that Jacob ended up catching the biggest fish which was around 8 lbs. Flooded or not, the fish didn't care. After all, they were already wet. Thank your nephew for his service for all of us, glad you all caught fish! I was on the water briefly yesterday and marked lots of fish. Was not there to fish, but sure made me want to. wow. Maybe I should have fished yesterday. Looked hopeless with all that water. Nice haul tex_toby. John Blasingame is an awesome guide for sure. Glad you had a great trip. Tell your nephew thanks for his service. Excellent!!! Thanks to your nephew for his service!!! !